Munster have made 11 changes to their team to face Benetton tonight in a game which could have a big bearing on both Glasgow’s and Edinburgh’s Pro14 play-off hopes. The Irish province, who have a Champions Cup semi-final tie against Saracens next weekend, have rested internationals such as Conor Murray, Peter O’Mahony and Chris Farrell for the trip to Italy, and brought in academy players Gavin Coombes and Shane Daly. Three points behind Glasgow in Conference A with two games to go, Munster are already sure of a place in the play-offs, but their chances of finishing top and claiming a home semi-final could well be over if they lose in Treviso and Dave Rennie’s side win against Leinster in Dublin tomorrow. Benetton are currently third in Conference B, a point ahead of Edinburgh and two behind Ulster, who meet tonight at Murrayfield. They could clinch a play-off place this weekend should they defeat Munster and Edinburgh lose this evening. With a final-round fixture at Italian rivals Zebre still to come, they will be odds on to reach the play-offs for the first time if they win tonight. Munster are at Connacht in their last game of the regular season, while Edinburgh visit Glasgow. All seven matches in the final round are on Saturday 27 April. 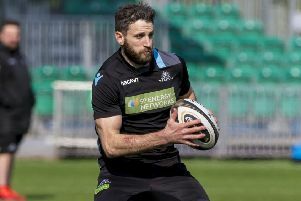 Meanwhile, the Warriors team to play Leinster will be announced today, with Chris Fusaro set to continue at openside in the absence of Callum Gibbins. The 29-year-old Fusaro seemed to be in danger of becoming a marginal figure in the squad, but injuries to Gibbins and Matt Smith gave him the opportunity to re-establish himself, and his fine form since has been acknowledged by Rennie’s making him captain for some games. “It has been a good run,” Fusaro, pictured, said. “Obviously, there were a couple of injuries in my position, so one man’s misfortune is another man’s good fortune. I’ve had a decent run of games, which gives you a bit of confidence. “As I get older, there are more and more young guys coming through – the likes of Matt Smith, Bruce Flockhart and people like that – so to keep getting opportunities is very important. You want to keep showing what you can do.